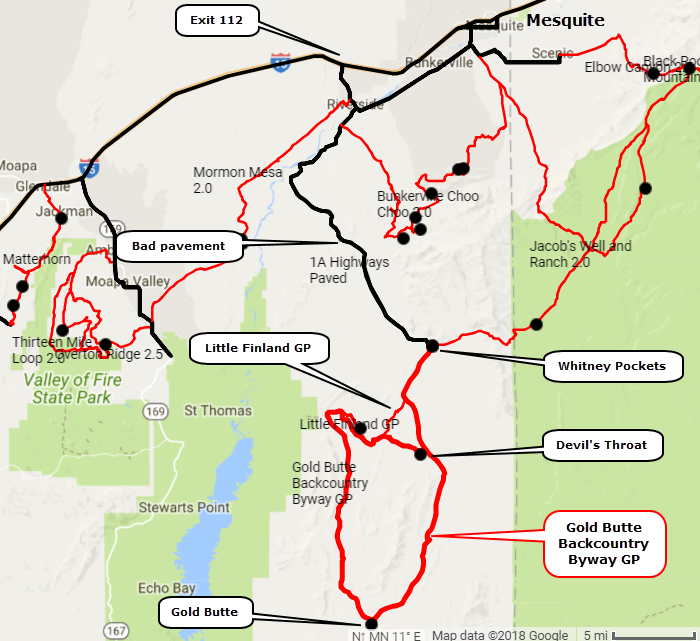 This Byway is primarily in the Gold Butte National Monument, established in 2016. 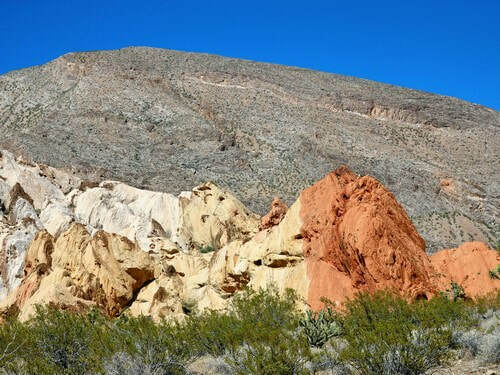 ​This trip offers opportunities to see desert wildlife, red and white sandstone, sinkholes, petroglyphs, the Muddy Mountains and Lake Mead. The historic mining town of Gold Butte, established in 1908, is along the route. This is a hundred mile round trip from I-15 and will take up much of a day. It provides access to the heart of the Monument and all the attractions included in the area, including Little Finland. 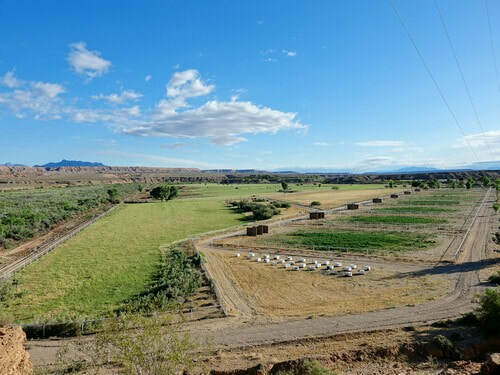 The first few miles of this trip is through agricultural land along the Virgin river. 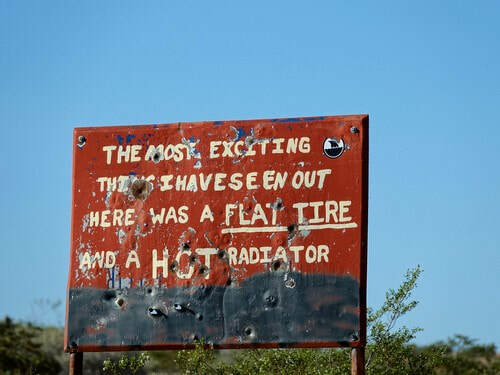 Not everyone is enthusiastic about the area according to the sign. We read that the first 20 miles of the Byway were paved, so we thought that "paved" would equate to "fast". WRONG! It may have been a nicely paved road at some time but it now full of potholes and torn up pavement. We normally do not air down our tires until we leave pavement, but we quickly made an exception here. The "pavement" ends at Whitney Pockets, an area of colorful sandstone outcroppings. See the opening photo of this page. 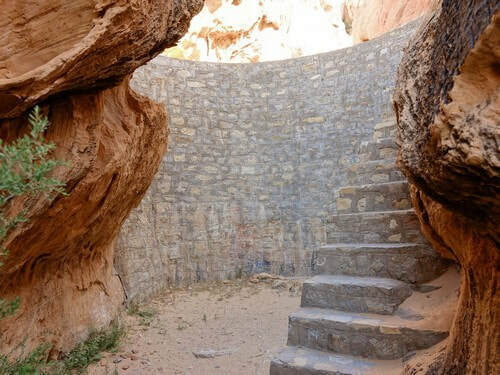 The Civilian Conservation Corp (CCC) completed some work at Whitney Pockets from 1933 to 1942. A concrete dam was built at a crevasse in the sandstone in an attempt to catch water. Piping from the dam lead to a livestock watering trough. A nearby cave was walled in by the CCC. Parts of the walls are now disintegrating rapidly and a sign urges the public to assist in conserving what remains. In spite of CCC and cattlemen’s efforts to harvest the scarce water supplies, this region does not favor successful ranching. The summers are unbearably hot and often the winters are quite harsh. 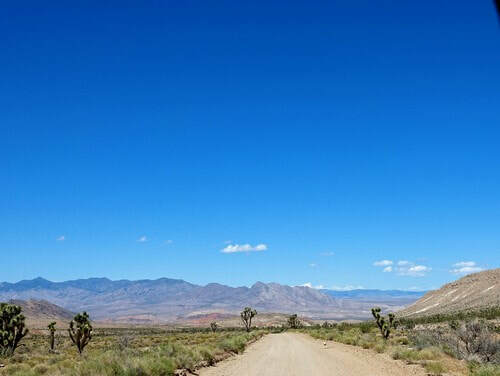 There is a short 4WD road west of Whitney Pockets with a few kaleidoscope rock outcroppings. The road continues south of Whitney Pockets then makes a big loop from Devil's Throat, through Gold Butte and back to Devil's Throat. 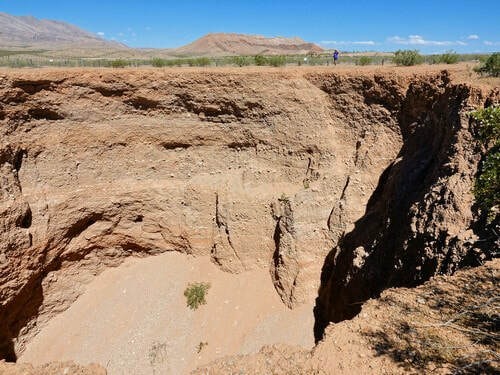 Devil's Throat is a sinkhole some 100 feet wide and nearly as deep. It was formed a few decades ago by underground water movement. The underlying geology is most likely limestone which dissolves when acidic water passes through the fissures and cracks. Eventually caverns form below ground, the roof collapses and sinkholes such as this are formed. A fence surrounds the hole for safety, yet must berelocated occasionally as the hole continues to erode and grow. Quote from Bud Sanders. ​The two sides of the loop are completely different. The east side is a continuation of the wide, fairly straight, road you have been on. 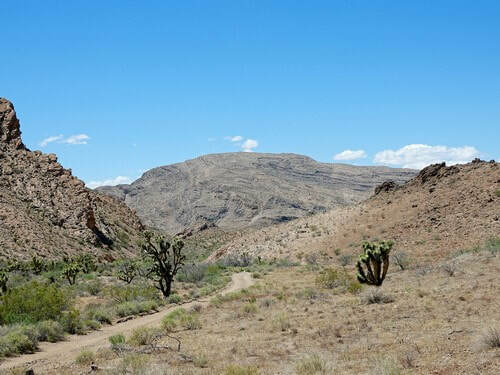 It is in a wide valley with expansive views of mountains on all sides. The west side is also an easy road, but it is much narrower with curves and hills. Surrounding hills are closer and lower so views are not nearly as dramatic. 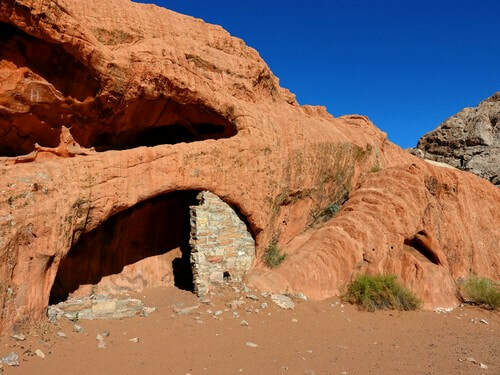 The town of Gold Butte was established when gold was discovered in the area in 1906. Due to the lack of wood and other construction materials in the area, however, it was less of a permanent settlement and more of a tent city. 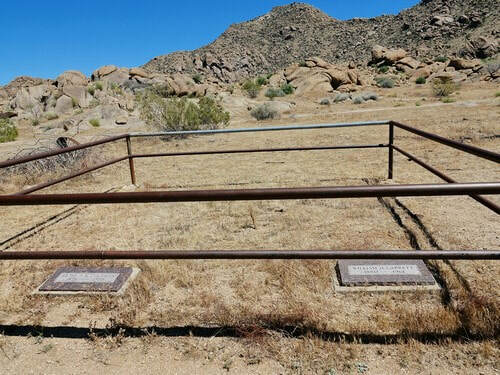 While the town boasted about 2,000 residents, a post office and a saloon at its peak, the gold played out rather quickly and, by 1909, the post office in Gold Butte was closed due to a lack of residents in the area. Mining in the area continued long after the town ceased to exist, however. 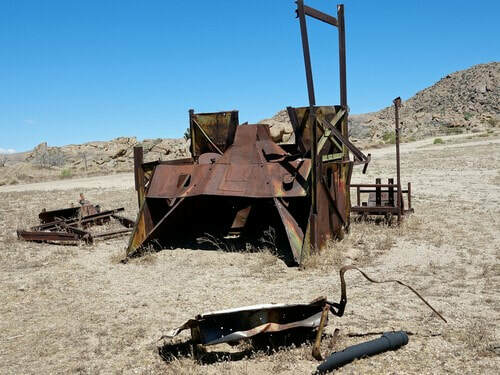 Up until the end of the first World War, a nearby copper mine sent shipments of ore down to St. Thomas, another Nevada ghost town that until the recent drought lay under the waters of Lake Mead. From St. Thomas, the ore was shipped out by rail until falling copper prices made the mine unprofitable. 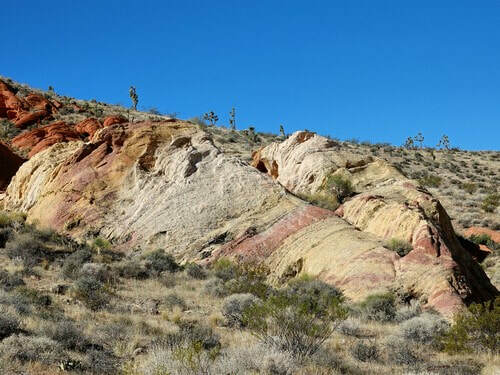 There was also a lone pair of prospectors who called Gold Butte home for decades after everyone else had called it quits. Arthur Coleman and William Garrett met in 1916 in Gold Butte as the town was already fading into history. Locals reportedly called them the “odd pair” and “the long and the short of it,” partly because Garrett, a rancher from Texas, stood about six feet tall while Coleman was just 5-foot-1. ​Read Bud Sander's article for a full description.